Environmental problem created by frequent starts and stops, how? As one of the first in Europe, the power industry of the United Kingdom has been fully liberalised. This has created opportunities for private companies, to invest in both new and existing power stations. London Power Company, a subsidiary of London Electricity, owns the 4 x 500 MW West Burton Power Station on the river Trent, in the eastern central part of England. All four units of West Burton Power Station will be retrofitted with flue gas desulphurisation (FGD) plants and new chimneys. The four units of West Burton Power Station fire a local, english coal. The sulphur content of this coal ranges between 1.7 and 2.8 %. 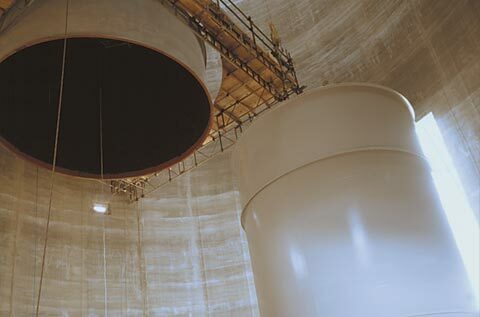 The installation of FGD plants will not only ensure, that current British regulations are met, but they will also prepare West Burton Power Station for the strict, European Union regulations that will become effective in 2008. As a merchant power plant on a liberalised market, the units of West Burton Power Station are subject to a flexible operating regime. During the winter season, the units operate in base load service. At other times of the year, especially in summer, they often operate on a “two-shifting” schedule, which calls for daily starts and stops. Typically all systems of the power station, including the FGD plants, will go through ca. 200 start-ups per year. A consortium of Mitsubishi Heavy Industries (Japan) and FLS miljø (Denmark) was selected for the turnkey delivery of the four identical FGD plants. The wet limestone FGD plants will have an SO₂ removal efficiency of 94 %. Each FGD system includes a rotating gas-to-gas heater, which reheats the treated gas stream to a temperature of ca. 88 °C. 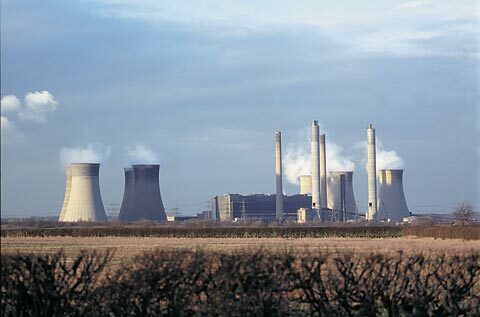 In conjunction with the FGD retrofit, West Burton Power Station will be equipped with new chimneys, as well. 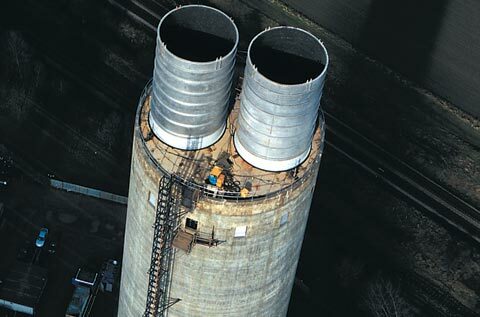 Each of the new chimneys is 200 m high and contains two, 6 metre diametre steel flues. The four steel flues are protected internally by the PennguardTM Block Lining System. An increasing number of coal fired power stations are experiencing frequent start-ups and shutdowns as they have to follow the demands of a free electricity market. West Burton Power Station is a good example; outside of the winter season, it often operates on a “two-shift” schedule, starting its 500 MW units every morning and stopping them every night. This cycling operating schedule creates many challenges for the station. The chimney is one of them: during every start-up, the chimney will be relatively cool. 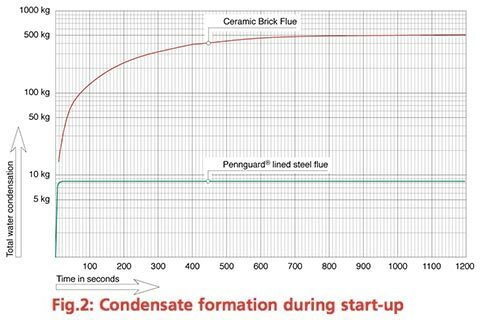 During the initial phases of operation, flue gas volumes are still small and while the internal flue surfaces are heating up, there is a strong formation of acid condensate within the chimney. In addition to causing strong condensate formation, the cool chimney also lowers the temperature of the exit plume. As a result, plume dispersion during start-up may be significantly worse than during steady state operation. Both of these phenomena can affect the environmental performance of a power station: the liquid condensate can be ejected from a chimney as acidic droplets or particles, and a cool exit plume has a higher risk of grounding near the station, causing increased ground level concentrations of flue gas components. The PennguardTM chimney flue linings used by West Burton Power Station will help to limit the risk of environmental problems that can result from frequent start-ups and shutdowns. The reason is, that these strongly insulating PennguardTM linings on the inside of the chimney flues will heat up very quickly during each start-up. Due to this “fast thermal response”, condensate formation is strongly limited and the exit plume reaches its full operational temperature within minutes. Figures 1, 2 and 3 show the results of a computer modelling study, to predict the condensation and temperature within a chimney flue, during a typical start-up of a 500 MW unit. 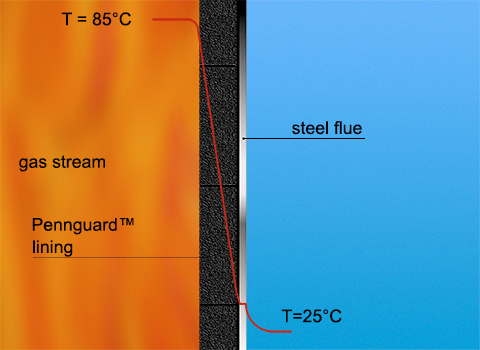 Figure 1 shows, how quickly the internal surface temperature of a PennguardTM lined steel flue will rise, when a 500 MW unit starts up with a low volume of 110 °C flue gas (start-up is without FGD). 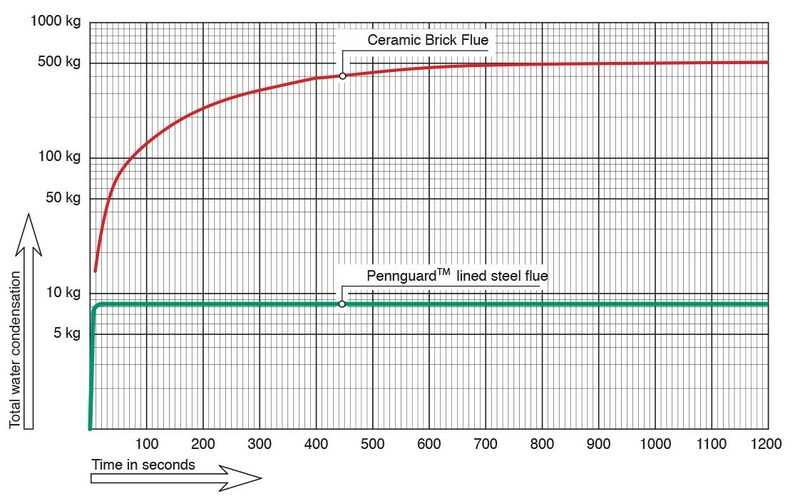 For comparison, the internal surface temperature of a chimney with ceramic brick flues is also shown. 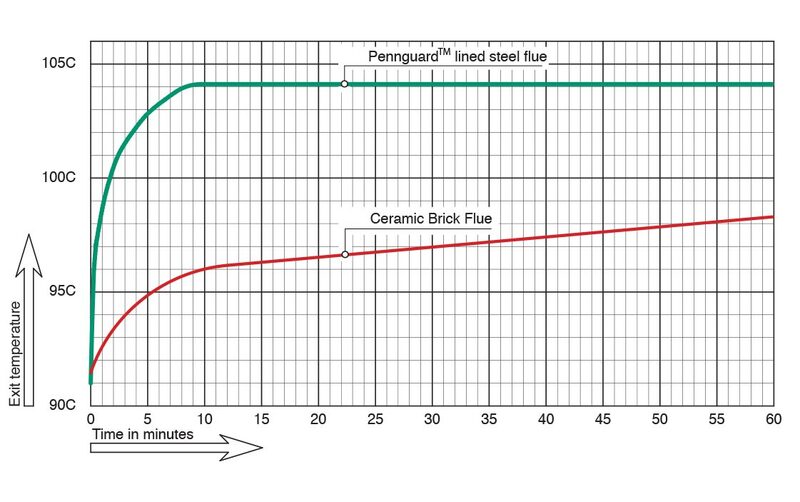 Figure 2 shows, how the quick temperature rise of a PennguardTM lined flue will help to limit condensate formation. In this case the flue surface temperature is high enough to virtually stop condensation, within seconds after the start of operation. The amount of condensate is limited to less than 10 kg. 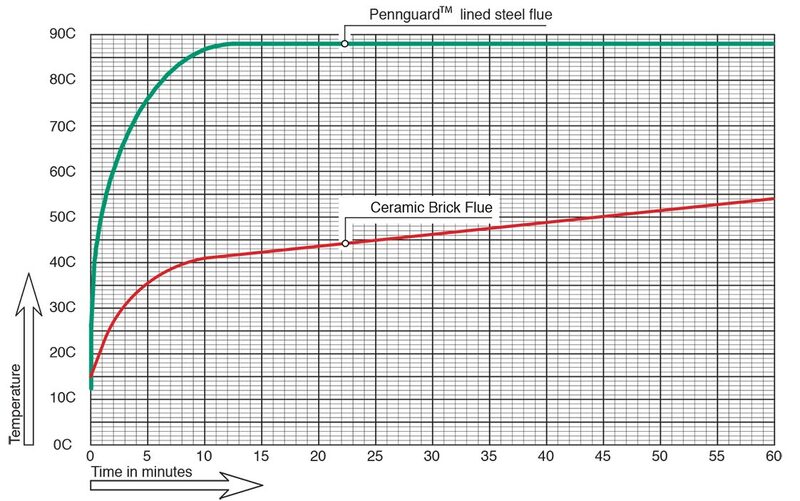 By comparison, condensate formation in a ceramic brick flue will go on for an initial 15 minutes of operation and the total amount of condensate in one flue is estimated to be over 500 kg. 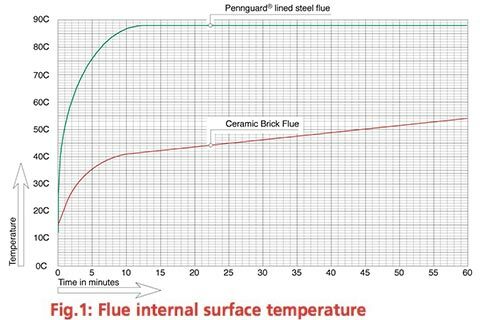 Finally, Figure 3 shows how the fast thermal response of a PennguardTM lining will help to quickly achieve a high exit plume temperature. 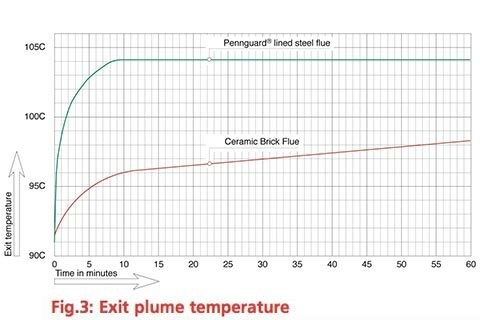 As shown, the exit plume from the PennguardTM lined flue achieves a steady temperature of 104 °C within 10 minutes. By comparison, the exit plume from the ceramic brick chimney flue is a little over 98 °C after one hour. Some 14 more hours will be needed to achieve 104 °C. The two new chimneys of West Burton Power Station were built by Bierrum and Partners Limited, a well established designer and builder of tall chimneys and other large civil engineering structures. Each chimney contains two, top hung steel flues. 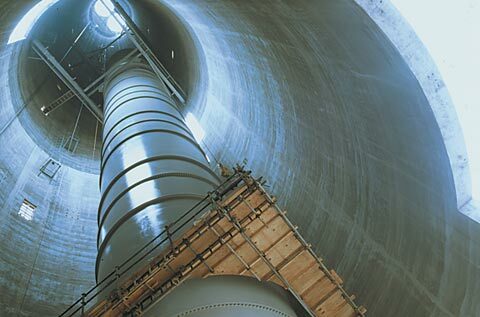 The flues are 160 m long and have a diameter of 6 m.
The installation of the PennguardTM lining system was performed before erection of the steel flues. 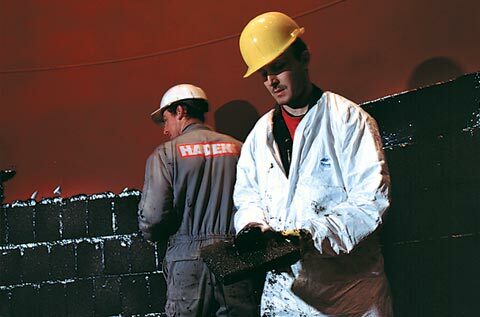 Steel flue cans, mostly 9 m high, were grit blasted and coated (with PennguardTM Block Primer) in a workshop and then transported to the site. On site, the steel cans were placed near the chimney, in a vertical position and the PennguardTM Block Lining System was installed. For the erection of the steel flues, the chimney builder chose an economical and time saving method. Rather than using field welds, the 9 m high, pre-lined cans were attached to the flue using bolted flanges. The flanges are 20 mm thick and bolts are placed on 100 mm centres. When lining the steel flue sections on ground level, the area immediately near the flange is left unlined. After tightening of the flange connection, this remaining area is also lined with PennguardTM, to achieve a continuous lining system. The main advantage of using bolted flanges is, that all welding work for the steel flues can be completed in a workshop, eliminating an expensive and time consuming field welding operation. 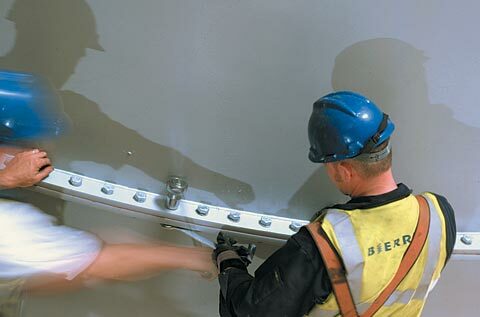 After erection, the bolted flanges also function as additional stiffeners for the steel flues.